Many times companies depend on contract filling services to fulfill their packaging needs. Contract packaging and filling companies like ourselves give clients the opportunity to have all of their requirements completed under one roof. However, over time, production needs can change, motivating businesses to look at investing in their own filling equipment. Owning an in-house liquid filling machine comes with various advantages, making it a prudent financial investment. 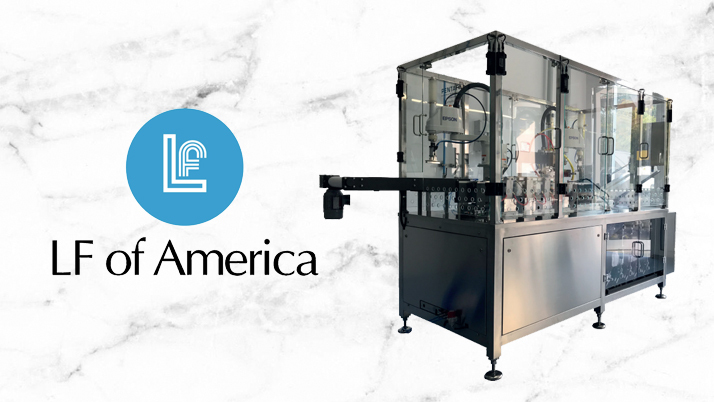 For this reason, LF of America offers companies the option to invest in their very own automatic liquid filling machine for plastic containers. Learn more about our line of filling machinery below or contact us to receive further details. If you’re still not prepared to invest in your own in-house filling machine, consider LF of America your perfect turnkey partner for all packaging and filling needs. Safe packaging is a necessity for all companies within the pharmaceutical, health and beauty cosmetics, veterinary medicine, and diagnostic industries. Product safety is of paramount importance and requires logistical planning throughout every phase of the production process, including filling and sealing. Our available contract filling equipment for sale exceeds all the safety standards while delivering truly reliable results. The Pentafill Machines utilize blow, fill, and seal technology in combination with injection molding. The advantages of using blow, fill, and seal with injection molding are increasing safety throughout the process. Rather than risk contact between product and heat by combining the blow and fill process, a potential danger which could damage the product, our liquid filling machine fills the containers first. Next, the containers are moved along for a separate heat blow process, ensuring no contact to the product. Then, the heat seal #1 and #2 take place. Finally, cold crimping completes the filling before unloading the containers to pick up. We offer various sizes for our liquid filling machines. The Pentafill liquid filling machine is capable of flexible filling sizes, filling as few as 1500 vials per hour up to as many as 15,000 per hour. Their small sizes make the filling machines easily adaptable into small areas. In addition, part maintenance is easily performed and the machines are easy to use. Moreover, our Pentafill filling equipment is surprisingly affordable, costing around half of what traditional liquid filling machines cost. 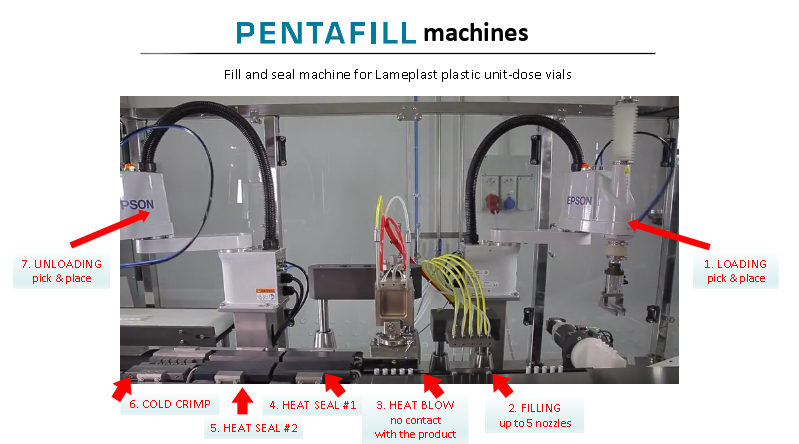 Watch the video provided below to view our Pentafill A25 Fill and Seal Machine during the production process. If you’d like to obtain more information regarding purchasing our automatic liquid filling machine for sale, contact our team. Take control of your production, save on outsourcing costs, and continue to grow your operation with the help of LF of America.